Thesis: Remote sensing of frost damage in winter sown wheat: identification of spectral response patterns across space and time. - potentially, aim to link frost damage to yield. To do this, a combination of laboratory and field-based remote sensing techniques will be applied to investigate the spectral response of wheat to frost over time at an appropriate number of phenological growth stages. Laboratory experiments will inform paddock level investigations to develop methods to identify the spatial extent of frost damage in the field. Results will provide a robust approach for frost identification that farmers can implement to improve farm management decisions and ultimately save money through targeted management strategies. 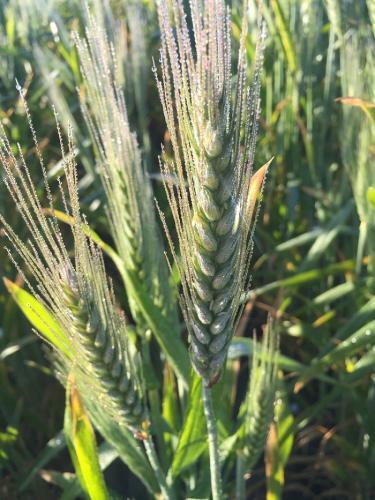 Radiant frost during the reproductive stages of plant growth (heading, anthesis) is a major constraint to the wheat industry, causing considerable wheat yield reductions and substantial economic losses. It has been estimated that frost costs the Australian grower approximately $360 million in both direct and indirect yield losses per year, with current estimates of direct losses due to frost sitting at approximately $120 million per year. In 2005, frost damage in Western Australia (WA) alone caused the loss of approximately 700,000 tonnes of wheat. With sustained economic impacts due to frost damage becoming an increasing burden on wheat farmers, interest in the risk of frost events occurring in the key wheat growing areas of Australia has increased. To combat the impacts of frost on wheat, four areas of research have emerged including: improving methods for predicting frost events, development of frost tolerant wheat strains, enhancement of farm management strategies to avoid frost or reduce frost risk, and early detection of post event frost damage and yield impacts. Making practical, time-critical “hay or harvest” management decisions in order to avoid losses from low yield, or through the application of unnecessary farm inputs, is one common method used to counteract the impact of frost on yield. As a non-destructive method of gathering data and estimating plant condition, remote sensing may provide a potential solution for identifying the geographic extent, or potentially the degree of frost damage, at the paddock scale, thus helping with the decision making process. Further to this, current climate models indicate that Australia’s grainbelt will become warmer and drier; with WA already experiencing a 20% decline in rainfall over the past 100 years. Warmer, drier climates are expected to increase the risk of radiant frosts due to reduced cloud cover allowing for cooler than average temperatures at night; however, the southern displacement of air masses bringing air from much further south than was previously experienced is also thought to be a key driver of change. The timing and frequency of frost events across Australia are shifting; more severe minimum temperatures are being experienced, frost windows are broadening in most states or moving to later in the growing season, and the number of frost events is increasing in southern and western regions. In addition, as our climate begins to change, it has been determined that for every 1º C increase in temperature, flowering and maturing of wheat are occurring approximately 7 days earlier. This acceleration of plant growth and development results in the more susceptible reproductive stages occurring earlier in the growing season, potentially coinciding with conditions that are at a higher risk of radiant frost. Frosted heads thawing just after first light.